"We have a mission," said one student after the Zapatistas' school. "That every one of us, in accordance with our ways and places, continue organizing." 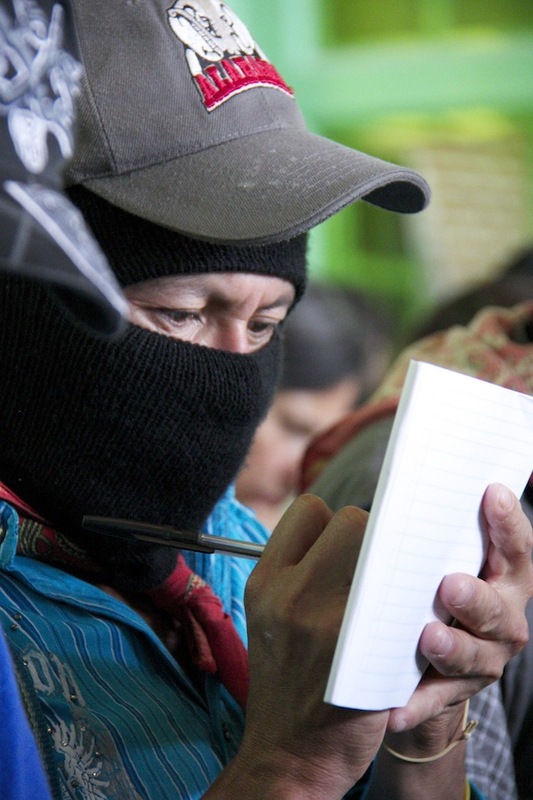 The 1700 students who travelled from across Mexico and the world to attend the Zapatistas’first school last week are leaving with an important homework assignment: to transfer what they learned to their respective collectives and movements. Some left with blisters on their hands from working in the fields with a machete for the first time. Others told stories of waking before the sun rose to prepare tortillas and beans and pozol (water with corn flour added) for their companions who were going to work in the milpa (cornfields) and to chop and carry wood. As the students prepared these meals, often for the first time, they listened to the sounds of indigenous languages like Tojobal, Chol, Tzeltal, and Tzotzil. As they ate, they shared experiences and began understanding that their sense of resistance came from their own families, from the very beginning of their childhoods. Others said that liberty lies in exercising autonomy without government help. It is the hard daily work that allows the Zapatistas to survive without the government and be free, said the students. Coherence, resistance and responsibility were words they repeated often in describing the Zapatista way of life. “To be free is to be able to decide for themselves what lives they want to have,” said Marcos. “What education they want. How they want to raise their children. How they want to organize. We have to go to the supermarket, go to the school that the system offers us to then reproduce that system — at university as well. We have to take the healthcare system that the system offers us and that we don’t understand,” he said. During the school, Toño from Brazil stayed in the Rosario de Río Blanco in the Caracol La Realidad, close to the city of Las Margaritas. “It was the best school I’ve been to in all my life,” he said. Toño and other students learned how a Zapatista family can live peacefully in communities where the majority of people support the PRI, the governing Institutional Revolutionary Party, and receive money from government projects. “But if one day they lose their government financial support, they won’t know what to do,” said Toño. Erwin, a student from Cuetzalan, a small town in the Mexican state of Puebla, works to build autonomy for the community where he lives, and he understands how the Zapatistas navigate relationships with their non-Zapatista neighbors. Many felt that learning how the Zapatistas live alongside, and assume a non-confrontational attitude toward, people who don’t think like them was an indispensable lesson. Non-Zapatistas can even come to the autonomous clinic when they are sick, and they will be attended to rather than rejected. “In this same community we greet all people who are not Zapatistas with affection, because we are all affected by the system…The real enemy is the same, the system,” said Erwin. The fact that oftentimes students did not speak the same language as their host families, teachers and guardians, called votanes, was not necessarily a problem. “We wound up understanding each other,” said 17-year-old Camila, who is a student at the College of Sciences and Humanities at the National Autonomous University of Mexico. The texts provided by the Zapatista school were very different than those she was familiar with from college. “They explain through anecdotes, which are reflections of practice.” Camila said she hopes that a second grade will be added to the escuelita, and that, if one is, she will be allowed to attend. She said she learned over the course of those five days that autonomy exists and is possible. The lesson that most impacted Uruguayan Mónica Olaso was when she asked her teacher why they were summoned and what the Zapatistas expected of the students. The response, Mónica recounted, was, “You know, Mónica, a bullet is not going to reach Uruguay. But our word will.” She is returning to her country, she said, with the mission to insist on organizing with the patience required to realize the commitments they make with people in her communities. She also feels the responsibility to pass along the lessons both in the books she was given by the Zapatistas and those already within her — her experiences. “The Zapatistas wanted us to hear them, to see them, to share with them their experiences of struggle. Now, we have a mission: that every one of us, in accordance with our ways and places, continue organizing according to our context,” said Mónica from Uruguay. Toño, who is part of the Passe Livre Movement in Brazil, which helped organize the mass protests against the fare hikes earlier this summer, agreed. “Rural movements, urban movements, no matter which. But we have to learn how to be more autonomous, and therefore we will be more free. We will even live alongside the enemy itself, because if you are autonomous and free, then you can live with them,” he said. Alex, a student from San Francisco, Calif., stayed at the Caracol La Realidad with Toño during the school. He says that he learned discipline, listening and the importance of having a long-term strategic vision. In his opinion, these are three things that are missing from social movements in the United States. “There are two main lessons,” he said. “First, is the discipline to accomplish what you say you’re going to do. The second is being self-critic and evaluating our mistakes and victories.” He quoted the Zapatista saying — “we walk slowly because we are going far” — as he explained the longevity of the movement: the Zapatistas have already celebrated 30 years since founding the EZLN, 20 years since establishing the municipalities and starting to build their autonomy, and ten years since the creation of the autonomous governing structure, the Councils of Good Government. This long-term view, Alex said, is lacking in the United States. The University of the Earth, in San Cristóbal de Las Casas in Chiapas, the seminar was a gathering of members of indigenous communities from around the world. The location for the inaugural seminar was significant because the Zapatistas are organizing — like so many other indigenous communities in resistance — to defend their territories from threats by transnational corporations, narco-trafficking and governments. Some students who attended the escuelita to listen and learn with Zapatista families about the meanings of liberty and autonomy also attended the Tata Juan Chávez Alonso Seminar. Indigenous participants shared their victories and organizational missteps as a way to measure of the strength of the indigenous communities that conform the National Indigenous Congress, and those who still do not belong to it. The ongoing seminar will continue to re-convene in different regions of the Americas and is intended to create a traveling forum for indigenous voices, while the Zapatistas have announced that they will hold a second escuelita this coming winter. The Zapatistia school article was one of the best I’ve seen here. May I recommend to you and your readers? It is Wobblies & Zapatistas, from PM Press, a text in the form of questions put to one of the two authors by the other. The questioner is Andrej Grubacic, and the respondent is Staughton Lynd. This works well both because the questions are leading ones, in the best sense of the term, and Lynd is a lifelong activist in the A J Muste tradition. 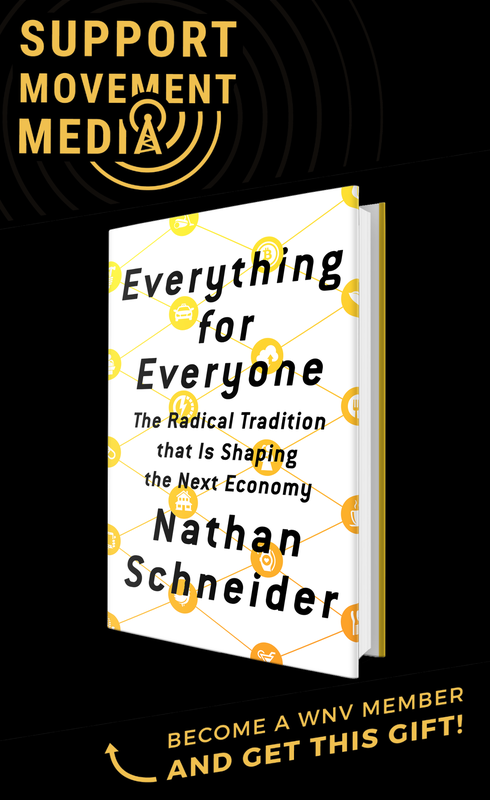 I highly recommend this because of its down-to-earth, real-life-situation way of illustrating practice and theory (and values), all without a lot of jargon and academise. I love all of Marta’s articles, especially these recent ones following the movements of the EZLN. Thank you. I wanted to attend the school too, but was unable. Reading many of the documents on their website, particularly the 7 Ellos y Nostros (Them and Us) communiqués was the next best thing.